All transactions are safe and secure with a reliable history in online purchasing behind each of our associates. 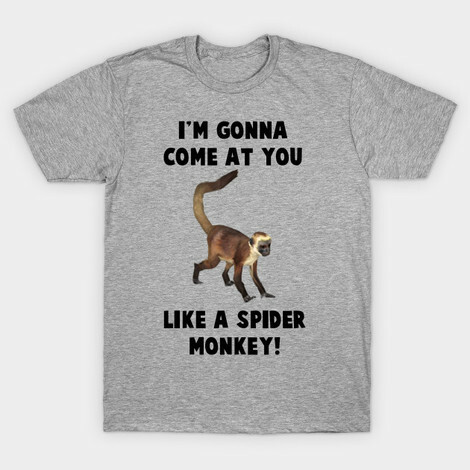 Buy the I'm Gonna Come at You Like a Spider Monkey t-shirt to own Talladega Nights clothing and merchandise. The front of these Talladega Nights t-shirts display a spider monkey next to the funny Talladega Nights quote, "I'm gonna come at you like a spider monkey." Ricky Bobby's son, Texas Ranger, tells this to his grandfather after the grandfather criticizes the upbringing of Ricky's children. This occurs at the dinner table scene with Cal. The monkey on this tee is ready to strike. Let your friends know that you won't hesitate to come at them like a spider monkey! It is also available in men's sizes. In addition to the I'm Gonna Come at You Like a Spider Monkey tee above, browse the Talladega Nights Clothing Gallery for more apparel like men's and women's clothes, kids shirts or hoodies.